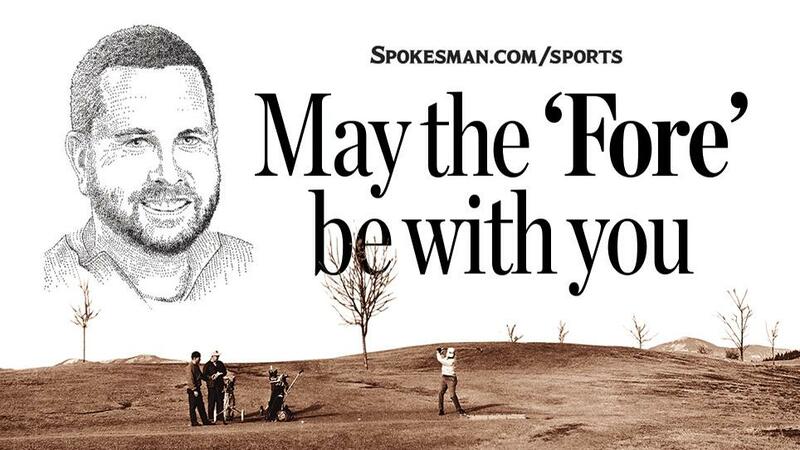 UPDATED: Sat., May 5, 2018, 10:25 a.m.
Be sure to look for Jim Meehan’s golf column, which will appear on Saturdays during the spring and summer in The Spokesman-Review. Back in the mid-1980s, my golf coach at East Valley High School, Harold Weakland, told me it was time to give up my dream of playing in the NBA. Turns out I was neither. Yet every spring, I still get that itch to drag out the clubs. Maybe it’s the excitement of watching the Masters on the tube every first week in April. Maybe it’s the chance to step outside without a parka for the first time since Halloween. Maybe it’s the “joy” of discovering a half-eaten sandwich in my bag from my last round – six months ago. Duck hook. Shank. Chili dip. Does it really matter that three of the first four shots of my golf season sound like something you’d order off the appetizer menu at Applebee’s? Because I know how lucky I am to be living in a place where golf is both amazing and affordable, regardless of how amazing or atrocious the game can sometimes get. From North Idaho and Liberty Lake, to north of Spokane, to the South Hill and beyond, you can’t beat the price, beauty or accessibility of our area’s courses. Indian Canyon, often ranked among the Top 25 public courses by Golf Digest, is still one of my favorites. The views are simply stunning and there’s nothing like a cold drink on that scenic deck with your pals as you dissect the bladed chip-in on the par-5 18th that salvaged your snowman. You want accessible? You can’t beat Esmeralda and Downriver, two historic Spokane courses that mix shorter distances and flatter fairways to offer even the most ordinary golfers a chance to break 90 (or in some cases, 100). You want more natural settings? Out on the Palouse Highway, there’s Hangman Valley and The Creek at Qualchan. Both beautiful, challenging and unique. I once holed out a wedge for an eagle on Qualchan’s first hole – a breathtaking 359-yard, par-4 beauty – followed, I believe, by back-to-back snap-hook drives on the 398-yard second hole that found their way onto the actual highway. The local courses are so varied and spectacular that for this year’s golf section, which comes out May 25, Spokesman-Review golf columnist Jim Meehan polled local pros on the area’s best holes – in order – and we’ll present them on one card – a Dream Eighteen. Surprisingly, Jim didn’t ask me or I would have started with Qualchan’s No. 1 as my choice for the opening hole. I would have also suggested a hole or two from Circling Raven as card-worthy. I have multiple quintuple bogeys to prove it. It’s also difficult to imagine the 26-mile, par-5, 16th at MeadowWood not making the cut. If the wind is blowing at you on that hole, you might as well just pitch a tent and start up again in the morning. Next to MeadowWood, you’ll find Liberty Lake. Years before the 2010 remodel, I nearly drained a hole-in-one on the par-3 seventh – hitting the flagstick after a skulled 8-iron. In the end, I three-putted for a four, although I’m fairly certain that ball would have fallen for an ace on the new-and-improved front nine. I’ve always had fond memories of Liberty Lake, East Valley’s home course back in my Jeff Spicoli days. Despite Weakland’s best efforts – he even arranged weekly lessons from Liberty’s assistant pro at the time, Gary Lindeblad – I don’t recall our team actually winning a match when I played there. In fact, Lindeblad confessed to me years later that he used to refer to our squad as The Suitcasers, because of the way many of us carried our strapless bags. Some labels you simply can’t shed, as I learned last summer during an unlikely round at the Kalispel Golf and Country Club, where Lindeblad now serves as the Director of Tournaments. “Next to the tee,” came the announcement from above, “Jim Meehan, John Blanchette, Steve Bergum and … Suitcaser.” Naturally, I topped my first drive. Cashing out your 401k might be the only way you can afford to play Kalispel, but it’s worth every penny. It’s truly magnificent. For the long drivers in your group, you might check out Deer Park and Chewelah. Very different course layouts, but both very challenging and affordable. In fact, watch for terrific deals in this very newspaper over the next several months. If there’s anything I like more than golf, it’s cheap golf. Or even better – free golf. I lost nine balls – 12 if you count the three I loaned Jess. Twice, I hit shots backward. And I even whiffed a putt. The two of us combined on a scramble and still lost badly to our brother-in-law, Al. No worries. I’ve already moved on, and am planning my next round – this time with Meehan – in the coming days. I just hope I don’t find another sandwich in my bag. Published: May 2, 2018, 5:24 p.m. Updated: May 5, 2018, 10:25 a.m.